It might seem strange, but the book I am reviewing today is a book that will probably talk you out of trading binary options. Moreover, I will say ahead of the full review text that I really recommend you to go and download that ebook and read it to save you a lot of time and money. It is free by the way (at least as of August 2014). However, while I mostly agree with the main idea of the book, I have some important comments on the factual side of its content, as well as on the conclusion made in it. 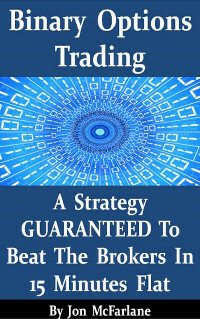 Binary Options Trading: A Strategy Guaranteed To Beat The Brokers In 15 Minutes Flat was written and published by Jon McFarlane on July 31, this year. Jon McFarlane is a founder of two rather helpful Forex trading websites — Systems for Traders and ForexUseful. According to his own words, he has extensive experience in traditional financial trading and limited experience in binary options. The book itself is very short. It took me much less than 15 minutes to read it, so it is definitely worth looking at, even if you do not agree with anything Jon says there, though he is really more often right than wrong. Binary options are not for everyone. Binary options are not a way to quick riches. Binary options are not some easy financial instrument to trade from your couch or beach or whatever other crazy place the ads might come up with. Binary options are mostly advertised unethically and dishonestly to make them seem what they are not and to hide the real dangers of engaging in binary trading. McFarlane calls the possibility of trading from any place a disadvantage. While, I definitely agree that a trading workplace should not be in some noisy or distracting environment, the author’s statement goes against the formal logic. Such thing is an opportunity of choice. That means that it is not imposed on trader, but rather can be used at trader’s will. Obviously, having an opportunity to do either A or B is not a disadvantage in comparison to an opportunity of doing only A. Additionally, nowadays, it is possible to trade anything at all (Forex, equities, commodities, etc.) in all forms (spot, vanilla options, futures, etc.) from any place. Although in the beginning of the book, the author states that binary brokers offer a wide range of timeframes for trading, throughout the rest of the book he mentions “5 minutes, 15 minutes, 1 hour timescale” as if it is the complete selection of what binary traders are exposed to. Namely, he states that “Not one person on this planet can, with regular success, accurately predict where any market is heading in the next 5 minutes, 15 minutes, 1 hour timescale on a more accurate basis than a coin flip”. What about other timeframes? Stating that binary options is gambling compared to vanilla options because the former are simpler than the latter is also incorrect, in my opinion. I suggest reading Hamish Raw’s book to get the idea how “simple” they actually are. Near the end of the book, Jon describes his horrible experience of dealing with one of the Cyprus-based binary brokers. While it is definitely a useful tale of warning, for some reason, he does not mention the name of the company. It would really help other traders who would like to try out binaries not to deal with those crooks. All in all, I encourage you to download Jon’s book and read it yourself, especially if you are new to trading and unsure whether it is a good idea to start trading binaries. And yes, I am a webmaster of a website that earns affiliate commission from brokers (based on your deposits) and I recommend reading a book that will most probably dissuade from opening a BO account. That is for the “none of these website (owners) care about you winning or losing” statement. Update 2014-09-30: As of today it is sold for $5.99 on Amazon, which is kind of expensive for this kind of book. I would not recommend buying it at that price.